The new chipset is certified to work with both the Wireless Power Consortium's Qi (pronounced "Chee") wireless standard and the Power Matters Alliances charging specifications. 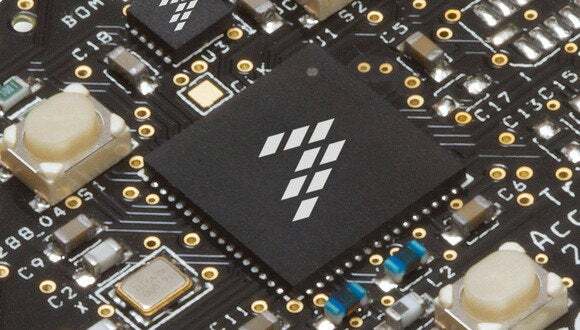 The current chipset supports a 5-watt charge, which is tailored to powering up mobile devices. However, the company expects to develop wireless charging chipsets for tablets, wearable devices and even kitchen appliances and power tools that require higher wattage. Freescale's multi-coil integrated circuit for automotive wireless charging products. Freescale's new wireless power-transmit controller chips and reference designs are different from other chips in that they don't target one standard or restrict customization. Flexibility in the chipset is provided through a programming interface that allows developers to modify the chips for their needs. "If a developer is creating an automotive wireless charging solution and they want in-dash wireless charging, what they have to consider is radio interference between key FOB and radio. So they can configure system based on number of coils they want," said Sujata Neidig, Freescale's manager of microcontrollers for the consumer business. "The more coils, the more flexibility in charging." Freescale's new chipset also supports the NFC (near-field communication) protocol, meaning data can be transferred between a smartphone or other mobile device and the wireless charger. For example, using NFC, a smartphone being charged wirelessly in a car could transmit data to the infotainment system, displaying on its screen how fully charged it is and how much longer any charging will take, according to Randy Ryder, Freescale's product and business development manager. Freescale's consumer wireless charging integrated circuit. Freescale's entry-level MWCT1001A chip provides a multi-coil wireless charging transmission, which allows more freedom movement for a mobile device charging on a pad. The company's premium MWCT1003A chip supports NFC, both the Qi and PMA charging specifications, and the automotive CAN (for controller area network) bus standard. CANs allow a vehicle's microcontrollers and devices to communicate with each other. For example, a backup camera can communicate with a car's braking system.